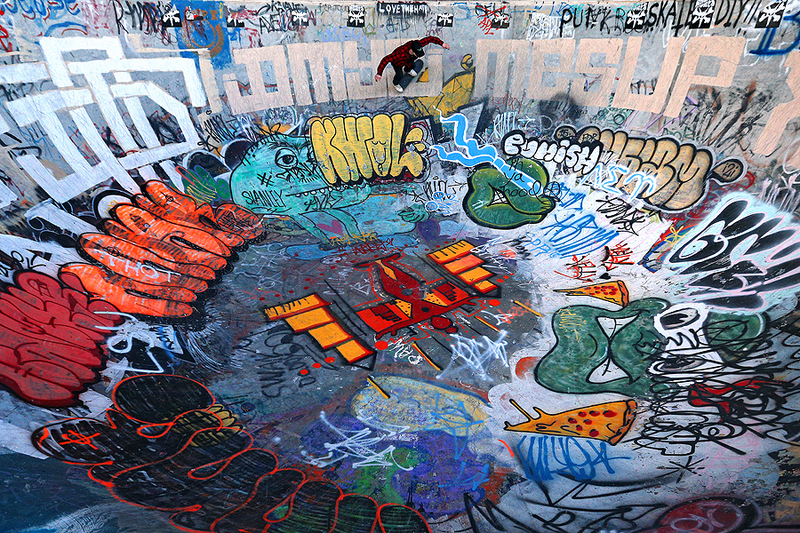 "A skateboarder rides a concrete bowl that is covered in graffiti at FDR Skatepark on March 30, 2016 in Philadelphia, Pennsylvania." The saying goes: one man's trash is another man's treasure. For my photographer friends living in Philadelphia, they've been to and worked the famous FDR Skatepark near the stadium complexes to no end. They probably think it's cliche. They avoid it because they've documented the action time and time again. But for someone who has known about it for more than ten years, yet has never been, it's like gold to my eyes. The other day I had to be in city of brotherly love to shoot a Flyers hockey game. Since I had a lot of time to burn, I thought after all these years I'd get over to the concrete paradise. It's hard not to find every moment attractive as graffiti perfectly covers every section of the park. While I know what makes a compelling action photo with extreme sports, I was continually drawn to the environment more than the skaters catching air off of the lip of the rail. I've now checked this off my want to shoot list, however, I am now already wanting to go back for more.